The Raging Tiny Tower Inferno of Doom! Woke up this morning to find it gloomy and cold outside. A perfect day for coffee laced with a bit of caramel. Apparently, we had a cold front move through last night. Today is supposed to be windy with a high of 68 degrees. Such a welcome relief from the record summer heat we experienced in East Texas. Good riddance! Had a friend email me this morning about the iPhone app Tiny Tower. He specifically asked: “Does this game ever end?” I am guessing the answer is no. 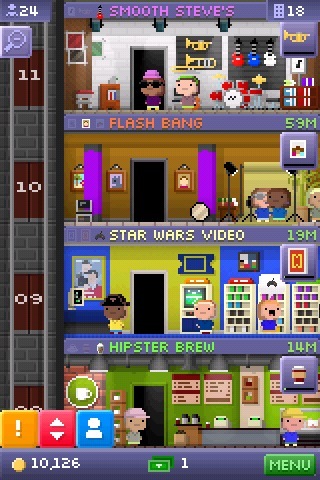 For the uninitiated, Tiny Tower is a tower building simulation for the iDevice. The game allows you to build different business types (retail, food, recreation, etc.) and then rack up the cash as consumers consume your tower’s products in droves. There is also another “gameplay” component that allows you to act as a slum lord/ hire and fire employees. For those that have a fashion bent, you can dress up your Bitizens to your hearts content. Keep in mind that this app is free with a catch, Tower Bux. Tower Bux are Tiny Tower’s currency that speeds up construction time and increases other in-game options. Think of Tower Bux as liquid patience. One of the beautiful things about this game is that you don’t necessarily have to purchase the in-game currency. Every once in awhile, the game will automatically award you Tower Bux for random events such as taking a Bitizen to a specific floor via elevator. Again, think of this slow feed Tower Bux concept as a drug dealer methodically bringing potential users in with a “taste” of his product. Overall, I have enjoyed my time playing Tiny Tower. My most favorite part of the game has been naming the individual stores. Where else can I have a coffee shop called Hipster Brew? I have to question though the longevity of playing this app. There do not seem to be any goals other than to build a massive profit-making tower. This will get old at some point. Like the donkey with the carrot on a stick, eventually I will just kick my rider off and eat the darned carrot. In the mean time though, I’m going to mindlessly distract myself by building another floor to my tower. Maybe I’ll expand the “Hipster” line of stores? Pingback: 2011 Reflections: Part 2 « JohnnyBGamer:.